I loved Pamela Erens’s first novel, The Understory. Like that book, her new novel is beautifully written. Every sentence is elegant and perfect, and they all flow together to create a lush whole. I know the author (she was kind enough to mention me in the acknowledgments, although I had nothing to do with the writing of this book and didn’t see any part of it in draft), but I can say that my reaction to the book is in no way colored by that. Given the subject matter–teenagers in a boarding school–I probably would not have read the book if I didn’t know the author, but that would have been a shame. I would have missed out on something special. For me, what stands out about this book (apart from the beautiful prose) is the narrative voice. The story is about star-crossed lovers, Seung Jung and Aviva Rossner, but it is told by Bennett-Jones, a voyeuristic boy who lusts after Aviva (and judging by the language he uses to describe Seung, may also have a thing for her boyfriend) and who mostly imagines the lovers’ relationship. He describes in detail their comings and goings, their thoughts, their conversations, even though he can’t possibly know them. True, he has pieced together bits of the narrative by asking his old classmates about what happened that year, but mostly he’s painting his own mental picture. Of course, he does play a role in the story, too, although the reader understands that he’s not entirely reliable. The overall effect is fascinating. 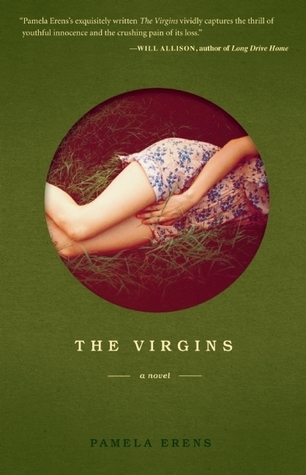 I usually don’t read reviews until after I’ve finished a book, but I did read this one by John Irving that appeared in last weekend’s New York Times: Pamela Erens’s The Virgins.